Hubspot have created a useful free download on the elements of context marketing which you can download here. Authors Robert Scoble and Shel Israel created the 5 Forces of Context Marketing in their book, Age of Context. They identified the convergence of five key components helping to fuel the growth of context marketing and helping to set the stage for a future digital world that will be re-defined through these 5 forces of: mobile devices, social media, big data, sensors and location based services. Mobile devices outnumbered humans in 2012 according to a report by Cisco. Author Mitch Joel refers to the The One Screen World where we should stop counting screens and create our content, products and sales channels for the one device in front of our customer’s eyes – whether that’s a smartphone, tablet or desktop – and our digital strategy should be encompassing all of these together, not treating each one in a silo. We are also witnessing mobile by its very definition to begin to redefine and flourish into new and innovative products such as the growth in wearables and the launch of Google Glass being the classic example. Juniper Research estimate the unit sales of wearable’s will rise from 15 million in 2013 to 70 million by 2017. With a lower barrier to entry, the growth in smartphone sales is also partly due to the opportunity of consumer choice with an abundance of different networks and manufacturers to choose from all offering the opportunity for tailored, personalised content delivered into the palm of your hand. It is estimated by Gartner that apps were downloaded 45 billion times by 2012. Social Media provides the basis for real-time, online conversations. It is expected that social will further integrate with these four other forces, providing a real time platform for people to connect, interact and share personalised content which can be distributed through your social connections based on your location and what you’re doing. Market research Company Forrester predicted that investment in social networks will increase by 300% over the next 5 years, a growth fuelled by the desire of individual and organisations to distribute timely content with their community. Social Media has “matured” to become a channel that directly supports and compliments other digital tactics employed by organisations, in particular SEO where the social signals are becoming a more important source of information to search engines to define the relevancy. As with the growth in mobile devices and the explosion in Apps, most if not all successful apps contain a social media component. IBM estimates that 90% of the world’s data was created in the last two years. This perhaps fuels the phrase, “Big Data”. But it isn’t Big Data we should be addressing, it should be about how to dilute the size of the data and make this actionable data, i.e. data that can provide insights, forecasting and opportunities for your organisation. The ability to disseminate, extract and segment data are the skills required by organisations in ensuring the data being monitored and measured is the data, data-sets that can have a positive impact on the business. The demand for analytics provides a level of quantitative analysis on key data sets impacting a business and more importantly, where informed decisions can be taken. For example, measuring data to understand how effective an organisation is in engaging and driving a reach objective through digital channels is essential in order to understand which channels need to be resourced and invested in. Avinash Kaushik, author and founder of Market Motive defined web analytics as “the objective of tracking, collection, measurement, reporting and analysis of quantitative internet data…for marketing initiatives”. With the explosion of data so there required organisations to provide data storage centres but at the same time, an ability for “Joe Public” to easily access and identify what data sets they were looking for, enter Google. What Google quickly realised was the requirement for this data to be categorised in a logical manner and PageRank was born, a complex grouping of algorithms to determine the relevancy of search engine pages. We’ve seen more recent entrants into this data market which have looked to create a niche and exploit opportunities in different ways to categorise such data with the arrival of Facebook and their focus on data sharing between groups of people and using your friends understanding of social behaviour patterns. Simple little things that measure and report on change and in doing so emulate the five human senses. Although having been in existence for more commercial, industrial requirements such as in factories, it wasn’t until 2007 and the launch of the Apple iPhone which introduced a sensor to provide the facility of a touch screen. Other sensors were also included such as the ability to change to horizontal or vertical view and finding Wifi. 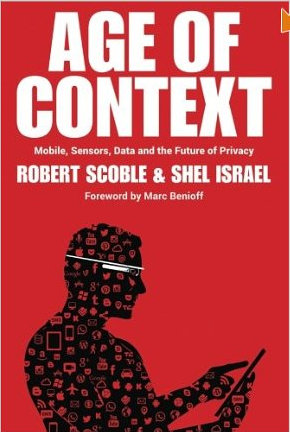 Authors Robert Scoble and Shel Israel of Age of Context regard Google as the ultimate contextual company. Recalling some of the innovative products Google has launched, it looks as though this is their ultimate goal, e.g. the development of their own Android operating system will provide them with the ultimate research in data sets of what audiences are doing, using it for, downloading and engaging communication with. Google Glass could prove to be the ultimate product in determining a suite of location based products in further building a complete picture of their audience. Thanks John for reading it!